Marieke Van Der Steenhoven ’07, curator of "Interwoven: The Lives and Works of Martha Hall" at Bowdoin College. As education and outreach librarian at the George J. Mitchell Department of Special Collections at Bowdoin College, Marieke Van Der Steenhoven ’07 connects faculty and students with more than 55,000 volumes of rare books. It was in this role that Van Der Steenhoven first learned about the books of Martha Hall ’71—a teacher, weaver, business executive, mother, wife, entrepreneur, artist ... and breast cancer patient. Hall, who died in 2003, documented every aspect of her experience with the disease through the creation of artist's books. She pushed the boundaries of the book form, processing her diagnosis, treatment, rediagnosis, and her relationships with her doctors and her body. Van Der Steenhoven cMarieke Van Der Steenhoven ’07 curates a unique exhibition at Bowdoin College featuring the works of the late Martha Hall ’71, who documented her long battle with breast cancer through the creation of artist’s books.Hall, an English major at Smith, taught middle-school English, studied weaving techniques in Sweden, and, in the 1980s, opened the legendary Martha Hall Looms and Yarns, a weaving and knitting store in Yarmouth, Maine, which grew into a national mail-order business. Her success in business led Hall to pursue a master’s degree from Dartmouth. Despite being diagnosed with breast cancer a week before she graduated, Hall went on to hold executive positions at American Express and L.L. Bean while being treated for multiple occurrences of the disease. Around this time, she also learned to create the artist's books that would be her legacy. Here Van Der Steenhoven talks about Hall’s life and work, the exhibition, and the healing power of Hall’s books. 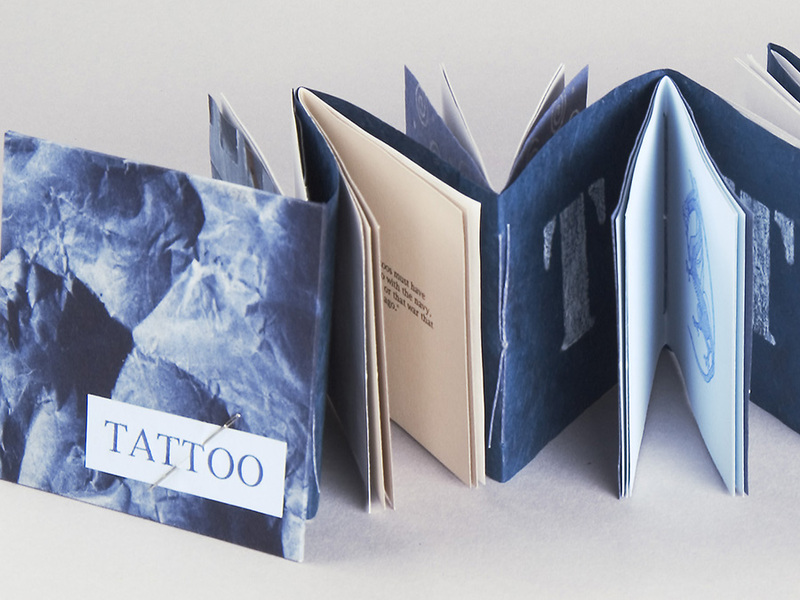 An artist’s book is a work created by a visual artist that is intentionally engaging with a book form and the act of reading. They are ways we can engage with challenging subjects. For instance, one of Martha’s books is Voices: Five Doctors Speak, which takes her conversations with five different doctors and uses a variety of different types of paper and typefaces for each doctor. It creates a more abstract narrative, while still making a point about the power of language. Martha Hall ’71’s Tattoo explores the stigmas around tattoos that are given through radiation. What was the inspiration for Interwoven: The Lives and Works of Martha Hall? In fall 2018, the Maine Women Writers Collection at the University of New England and The School of English at the University of Canterbury in the United Kingdom put together a symposium called Tell Me What Hurts: Story Telling and the Healing Arts, which used Martha’s work as a touchstone. Each of the panels was titled after some aspect of Martha Hall’s books. We wanted to continue the energy around medical humanities and this work that Martha had been doing with her artist's books. What other factor made the timing right for Interwoven? Martha’s husband, Alan Hall, decided to donate material related to all aspects of her life to Bowdoin. In those papers, you get a sense of her life as a book artist, but also all that came before. I think this is one of the reasons I’m so inspired by Martha Hall—with all the different directions she went in her life and the energy and curiosity and all the vigor she put into her life. She is such a Smithie! The exhibition would also be a way to celebrate these papers being here at Bowdoin. Which artist books of Hall’s are featured? We have several, including I Make Books, which she made later on in her life that talks about her connection between making books and being able to live with the knowledge that she was dying. Tattoo explores the stigmas around tattoos that are given through radiation. We also have her sketchbook for Tattoo and mock-ups of paper samples, so you can see the whole process of making that book.